Bamboos are very desirable garden plants. They can make large clumps that are ideal as focal points or for adding structure to borders. They can look unsightly if left to grow unhindered, and may become invasive. But keeping plants under control and attractive is easy with some simple routine maintenance.The leaves are borne on small branches which encircle the canes. In spring there is considerable yellowing of the leaves followed by some leaf drop. This is normal as new leaves are produced. Some of the old leaves often become papery and brown and stay attached to the plant long after they are finished. Things you might want to know about bamboo hedging. You should immerse new plants in water immediately, by first taking them out of the pot. They are everygreen plants that give your gharden a neat and well tamed hedge. They can even be used as stand alone plants and be trimmed/pruned to your standard. with a little effort it is easy to keep bamboos looking good and prevent them from becoming a nuisance in the garden.In spring, remove any weak, dead, damaged or spindly canes, cutting them to ground level with secateurs or loppersAt the same time remove any debris at the base of clumps. To show off plants to their best, remove some of the foliage from the bottom of the canes. Either snap the side branches off with a swift downward motion (wearing gloves) or cut them back with secateurs, pruning as close to the main cane as possible to leave a smooth finish. 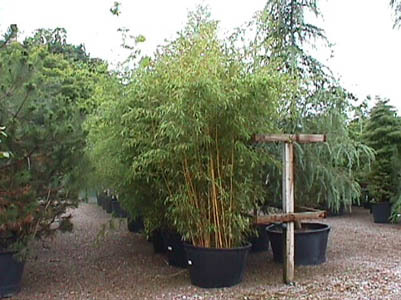 Bamboos do not like being left to dry out they always need to e in moist or damp onditions to help them thrive at their best. Bamboos are usually trouble-free, but may occasionally suffer from rust or root rots. In some years, bamboo aphids may become a problem. Feed during late spring and summer with a general purpose granular fertiliser and re-new the mulch layer. Bamboos perform best in rich moist soil. It is important to incorporate generous amounts of compost or well rooted manure to enrich the soil. Being very shallow roots they appreciate a good thick mulch of bark, compost, manure or leafmould. Keep well watered twice weekly for the next 3 months until they are established, then water during any dry spells. It is essential to thoroughly wet the soil so that the water penetrates down to the roots. If the bamboo is planted late in the year mulch heavily and try to give protection from cold drying winds.